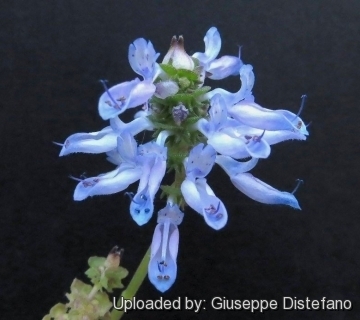 Origin and Habitat: Plectranthus neochilus has a wide distribution range in Zambia, Zimbabwe, Namibia, Botswana, and in Subtropical South Africa (central and eastern Transvaal, Swaziland, Natal Midlands and eastern Cape as far south as Albany District). Habitat and ecology: This species usually grows under trees in open woodland and among rocks (especially dolomite) in dry savanna regions. It is also common in the coastal thicket, often as part of the ground layer or in clearings and rocky placess together with other succulent specialists like Carpobrotus dimidiatus, Aloe thraskii, Aloe ferox, Aloe candelabrum, Rhipsalis baccifera subsp. mauritiana, Bowiea volubilis, Pachypodium succulentum, Euphorbia pentagona, Cotyledon orbiculata, Kalanchoe rotundifolia, and Sarcostemma viminale only to cite a few of the more common. Coleus carnosus Dinter ex Eliovson non A.Chev. Description: Plectranthus neochilus is a decumbent to erect undershrub 10-50 cm tall often much branched and bushy. The leaves are quite succulent, soft, lightly furry, sticky to the touch and their edges are somewhat saw-toothed. In autumn, purplish-blue, lobster- like in appearance flowers are carried in fairly dense, elongated spikes. The species is very variable. In South-west Namibia are often annuals with ascending stems, whereas in the eastern parts of its range the plants are mostly perennial and the stems decumbent; some plants occurring in grassy places have tuberous roots. In all forms the leaves are bad-smelling and the floral characters are relatively constant. It is one of several species of Plectranthus that have become popular as garden plants, and is better-known as the poor man's lavender. At a quick glance it indeed looks very similar to this well-known Mediterranean shrub. Derivation of specific name: neochilus from the Greek, neos (new) and cheilos (a lip). perhaps for the larger upper lip of the calyx. Stems: Obtusely quadrangular, succulent, without tuberous base, sparingly to densely villous with fine whitish hairs. Leaves: Subsessile or shortly petiolate, simple, clustered together, (20)30-45(-50) mm long, (15-)20-25(-35) mm broad, blade succulent, often viscid, elliptic or obovate, usually rounded at the apex, tending to fold along the midrib, margin shallowly crenate with 5 - 6 pairs of teeth, green and hairy on both surfaces, under-surface with orange gland-dots, cuneate at the base, aromatic when crushed. Petiole 5-15 mm long. The leaves of plants grown in shade are light green and fully expanded, while those of grown in full sun are coppery brown and folded lengthwise. Inflorescences: Elongate many-flowered spike-like racemes 70-150 mm long at the tips of stems, racemose, simple (occasionally with a pair of side branches); flowers in 3-flowered sessile cymes, forming 6-flowered verticils; verticils dense above, laxer and 5-15 mm apart below. Bracts submembranous, large, imbricate, greenish white tipped with purple, large, 8 mm long and broad, broadly ovate or suborbicular, with a long acumen, ciliate, early deciduous. Pedicels short, 2-4 mm long; fruiting calyx 6 mm long; upper tooth 3-4 mm long, broader than long, bluntly and shortly acuminate, strongly nerved; other 4 teeth lanceolate, acute, ciliate, 2 lower the longest. Flowers: Flowering calyx 3 mm long, campanulate, hairy; corolla mauve-purple, violet or blue12-20 mm long. Tube subcylindric, 6 mm long, deflexed about the middle and expanding towards the throat; upper lip bluish white erect, subquadrate, 2-3 mm long, 4-lobed; lower lip 8-11 mm long, boat-shaped. Nutlets dark brown, 1 mm. Stamens 8-11 mm long, united at the base for 2-3 mm. Cultivation and Propagation: Plectranthus neochilus has a handsome mound of light green leaves and is covered with small spikes of mid-blue flowers by early autumn. It grows easily in a well-drained, semi-shaded position and makes an extremely useful ground cover. Plants typically grow as dense, low-growing shrubs with short, erect branches, ifexposed to full sun.The stems tend to become more sprawling and lanky in the shade. It is frost tender and grows well in sub-tropical and tropical locations, but will do well in cooler climates if grown in a pot and brought indoors, or moved to a warm sheltered position in winter. 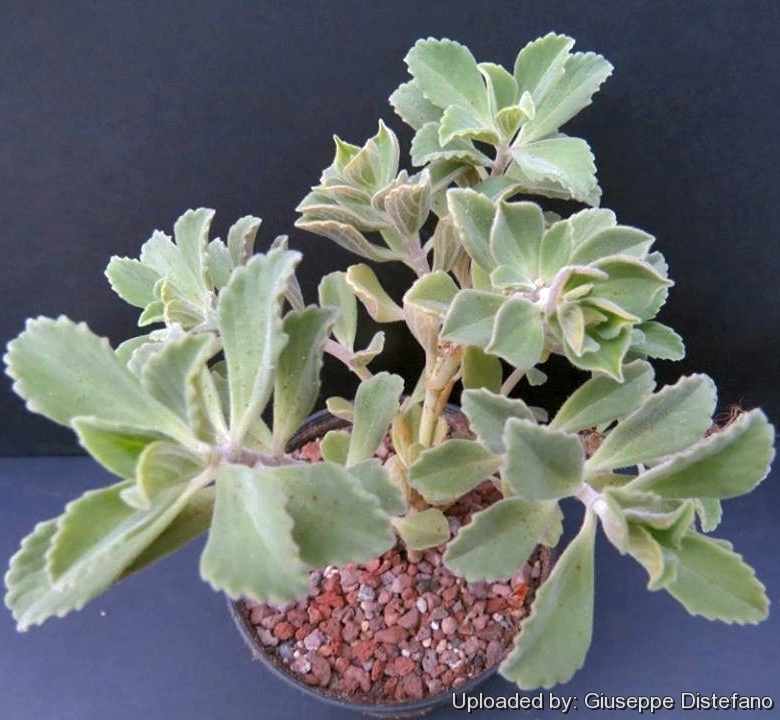 It needs little attention - and is quite hardy in a cool, well-lit conservatory or glasshouse, but grow well in a bright spot in the house too, need full sun to partial shade or high interior lighting with a well-drained soil mix. They do well outside in partial shade with good drainage. Exposure: Full sun; this species thrives in dry, luminous locations.. If it is getting too much sun, the leaves turn yellow, start curling and look unsightly. When grown under shady or partly shady conditions, it becomes scraggly and unattractive. It ideally should be grown in a semi-shaded as the leaves will remain a beautiful jade-green colour. Waterings: The plants are regularly watered and allowed to dry before watering again, pay attention don't overwater as stems may rot at the soil line. Some suggest to water just enough to keep the leaves from shrivelling this keep the plants more compact and enhances the leaves scent. If too much water is used, the leaves will turn yellow and get mushy. During the winter months, keep them quite dry or only water enough to keep the leaves from shrivelling. Fertilization: Fertilizer is applied only once during the growing season and it is diluted to half strength. Maintenance: The plants will vine but can be pinched to keep compact. Propagation. From soft-wood cuttings at any time during the growing season, cutting will grow within days. Rarely grown from seed because the plants seldom flower and set seed.